Adds syntax highlighting, autocompletion, hyperclick and tag matching to Marko files in Atom. The package provides an autocomplete-plus provider that provides advanced tag and attribute autocompletions for Marko templates in Atom. 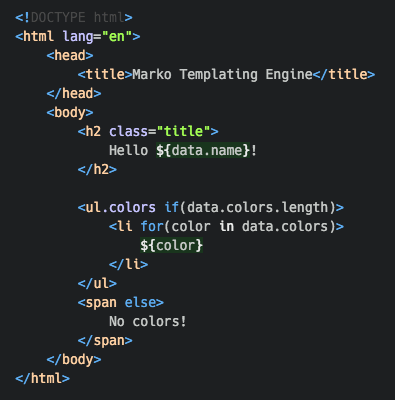 This provider uses the Marko compiler to get an accurate list of available Marko custom tags and attributes for each template. In addition, this provider also provides full support for autocompleting standard HTML tags and attributes. The package provides a hyperclick provider that makes regions of Marko templates clickable in Atom so that you can quickly jump to a custom tag implementation, an attribute definition, a file referenced by a path, an event handler method, etc.